The ActivityPub protocol is a decentralized social networking protocol based upon the [ ActivityStreams ] 2.0 data format. It provides a client to server API for creating, updating and deleting content, as well as a federated server to server API for delivering notifications and content. This document was published by the Social Web Working Group as a Proposed Recommendation. This document is intended to become a W3C Recommendation. Comments regarding this document are welcome. Please send them to public-socialweb@w3.org (subscribe, archives). The W3C Membership and other interested parties are invited to review the document and send comments to public-socialweb@w3.org (subscribe, archives) through 02 January 2018. Advisory Committee Representatives should consult their WBS questionnaires. Note that substantive technical comments were expected during the Candidate Recommendation review period that ended 30 November 2017. ActivityPub implementations can implement just one of these things or both of them. However, once you've implemented one, it isn't too many steps to implement the other, and there are a lot of benefits to both (making your website part of the decentralized social web, and being able to use clients and client libraries that work across a wide variety of social websites). These are endpoints, or really, just URLs which are listed in the ActivityPub actor's ActivityStreams description. (More on ActivityStreams later). ActivityPub uses [ ActivityStreams ] for its vocabulary. This is pretty great because ActivityStreams includes all the common terms you need to represent all the activities and content flowing around a social network. It's likely that ActivityStreams already includes all the vocabulary you need, but even if it doesn't, ActivityStreams can be extended via [ JSON-LD ]. If you know what JSON-LD is, you can take advantage of the cool linked data approaches provided by JSON-LD. If you don't, don't worry, JSON-LD documents and ActivityStreams can be understood as plain old simple JSON. (If you're going to add extensions, that's the point at which JSON-LD really helps you out). Of course, if that last one (GET'ing from someone's outbox) was the only way to see what people have sent, this wouldn't be a very efficient federation protocol! Indeed, federation happens usually by servers posting messages sent by actors to actors on other servers' inboxes. This is a note addressed to Ben. She POSTs it to her outbox. Since this is a non-activity object, the server recognizes that this is an object being newly created, and does the courtesy of wrapping it in a Create activity. (Activities sent around in ActivityPub generally follow the pattern of some activity by some actor being taken on some object. In this case the activity is a Create of a Note object, posted by a Person). Alyssa's server looks up Ben's ActivityStreams actor object, finds his inbox endpoint, and POSTs her object to his inbox. She POSTs this message to her outbox. (Since it's an activity, her server knows it doesn't need to wrap it in a Create object). Feeling happy about things, she decides to post a public message to her followers. Soon the following message is blasted to all the members of her followers collection, and since it has the special Public group addressed, is generally readable by anyone. ActivityPub is one of several related specifications being produced by the Social Web Working Group. Implementers interested in alternative approaches and complementary protocols should review [ Micropub ] and the overview document [ Social-Web-Protocols ]. A client to server protocol, or "Social API"
This protocol permits a client to act on behalf of a user. For example, this protocol is used by a mobile phone application to interact with a social stream of the user's actor. A server to server protocol, or "Federation Protocol"
This protocol is used to distribute activities between actors on different servers, tying them into the same social graph. This designation applies to any implementation of the entirety of the client portion of the client to server protocol. This designation applies to any implementation of the entirety of the server portion of the client to server protocol. This designation applies to any implementation of the entirety of the federation protocols. It is called out whenever a portion of the specification only applies to implementation of the federation protocol. In addition, whenever requirements are specified, it is called out whether they apply to the client or server (for the client-to-server protocol) or whether referring to a sending or receiving server in the server-to-server protocol. Objects are the core concept around which both [ ActivityStreams ] and ActivityPub are built. Objects are often wrapped in Activities and are contained in streams of Collections, which are themselves subclasses of Objects. See the [ Activity-Vocabulary ] document, particularly the Core Classes; ActivityPub follows the mapping of this vocabulary very closely. ActivityPub defines some terms in addition to those provided by ActivityStreams. These terms are provided in the ActivityPub JSON-LD context at https://www.w3.org/ns/activitystreams. Implementers SHOULD include the ActivityPub context in their object definitions. Implementers MAY include additional context as appropriate. ActivityPub shares the same URI / IRI conventions as in ActivityStreams. Servers SHOULD validate the content they receive to avoid content spoofing attacks. (A server should do something at least as robust as checking that the object appears as received at its origin, but mechanisms such as checking signatures would be better if available). No particular mechanism for verification is authoritatively specified by this document, but please see Security Considerations for some suggestions and good practices. it should dereference the id both to ensure that it exists and is a valid object, and that it is not misrepresenting the object. (In this example, Mallory could be spoofing an object allegedly posted by Alice). Publicly dereferencable URIs, such as HTTPS URIs, with their authority belonging to that of their originating server. (Publicly facing content SHOULD use HTTPS URIs). Identifiers MUST be provided for activities posted in server to server communication, unless the activity is intentionally transient. However, for client to server communication, a server receiving an object posted to the outbox with no specified id SHOULD allocate an object ID in the actor's namespace and attach it to the posted object. The object's unique global identifier (unless the object is transient, in which case the id MAY be omitted). The HTTP GET method may be dereferenced against an object's id property to retrieve the activity. Servers MAY use HTTP content negotiation as defined in [ RFC7231 ] to select the type of data to return in response to a request, but MUST present the ActivityStreams object representation in response to application/ld+json; profile="https://www.w3.org/ns/activitystreams", and SHOULD also present the ActivityStreams representation in response to application/activity+json as well. The client MUST specify an Accept header with the application/ld+json; profile="https://www.w3.org/ns/activitystreams" media type in order to retrieve the activity. Servers MAY implement other behavior for requests which do not comply with the above requirement. (For example, servers may implement additional legacy protocols, or may use the same URI for both HTML and ActivityStreams representations of a resource). Servers MAY require authorization as specified in B.1 Authentication and Authorization, and may additionally implement their own authorization rules. Servers SHOULD fail requests which do not pass their authorization checks with the appropriate HTTP error code, or the 403 Forbidden error code where the existence of the object is considered private. An origin server which does not wish to disclose the existence of a private target MAY instead respond with a status code of 404 Not Found. In addition to all the properties defined by the [ Activity-Vocabulary ], ActivityPub extends the Object by supplying the source property. The source property is intended to convey some sort of source from which the content markup was derived, as a form of provenance, or to support future editing by clients. In general, clients do the conversion from source to content, not the other way around. The value of source is itself an object which uses its own content and mediaType fields to supply source information. Note: What to do when clients can't meaningfully handle a mediaType? In general, it's best to let a user edit their original post in the same source format they originally composed it in. But not all clients can reliably provide a nice interface for all source types, and since clients are expected to do the conversion from source to content, some clients may work with a media type that another client does not know how to work with. While a client could feasibly provide the content markup to be edited and ignore the source, this means that the user will lose the more desirable form of the original source in any future revisions. A client doing so should thus provide a minimally obtrusive warning cautioning that the original source format is not understood and is thus being ignored. For example, Alyssa P. Hacker likes to post to her ActivityPub powered blog via an Emacs client she has written, leveraging Org mode. Later she switches to editing on her phone's client, which has no idea what text/x-org is or how to render it to HTML, so it provides a text box to edit the original content instead. A helpful warning displays above the edit area saying, "This was originally written in another markup language we don't know how to handle. If you edit, you'll lose your original source!" Alyssa decides the small typo fix isn't worth losing her nice org-mode markup and decides to make the update when she gets home. If the entered ID is a valid URI, then it is to be used directly. If it appears that the user neglected to add a scheme for a URI that would otherwise be considered valid, such as example.org/alice/, clients MAY attempt to provide a default scheme, preferably https. Otherwise, the entered value should be considered invalid. Once the actor's URI has been identified, it should be dereferenced. ActivityPub does not dictate a specific relationship between "users" and Actors; many configurations are possible. There may be multiple human users or organizations controlling an Actor, or likewise one human or organization may control multiple Actors. Similarly, an Actor may represent a piece of software, like a bot, or an automated process. More detailed "user" modelling, for example linking together of Actors which are controlled by the same entity, or allowing one Actor to be presented through multiple alternate profiles or aspects, are at the discretion of the implementation. A reference to an [ ActivityStreams ] OrderedCollection comprised of all the messages received by the actor; see 5.2 Inbox. An [ ActivityStreams ] OrderedCollection comprised of all the messages produced by the actor; see 5.1 Outbox. A link to an [ ActivityStreams ] collection of the actors that follow this actor; see 5.3 Followers Collection. A link to an [ ActivityStreams ] collection of objects this actor has liked; see 5.5 Liked Collection. A list of supplementary Collections which may be of interest. A short username which may be used to refer to the actor, with no uniqueness guarantees. A json object which maps additional (typically server/domain-wide) endpoints which may be useful either for this actor or someone referencing this actor. This mapping may be nested inside the actor document as the value or may be a link to a JSON-LD document with these properties. Endpoint URI so this actor's clients may access remote ActivityStreams objects which require authentication to access. To use this endpoint, the client posts an x-www-form-urlencoded id parameter with the value being the id of the requested ActivityStreams object. If OAuth 2.0 bearer tokens [ RFC6749 ] [ RFC6750 ] are being used for authenticating client to server interactions, this endpoint specifies a URI at which a browser-authenticated user may obtain a new authorization grant. If OAuth 2.0 bearer tokens [ RFC6749 ] [ RFC6750 ] are being used for authenticating client to server interactions, this endpoint specifies a URI at which a client may acquire an access token. If Linked Data Signatures and HTTP Signatures are being used for authentication and authorization, this endpoint specifies a URI at which browser-authenticated users may authorize a client's public key for client to server interactions. If Linked Data Signatures and HTTP Signatures are being used for authentication and authorization, this endpoint specifies a URI at which a client key may be signed by the actor's key for a time window to act on behalf of the actor in interacting with foreign servers. An optional endpoint used for wide delivery of publicly addressed activities and activities sent to followers. sharedInbox endpoints SHOULD also be publicly readable OrderedCollection objects containing objects addressed to the Public special collection. Reading from the sharedInbox endpoint MUST NOT present objects which are not addressed to the Public endpoint. As the upstream vocabulary for ActivityPub, any applicable [ ActivityStreams ] property may be used on ActivityPub Actors. Some ActivityStreams properties are particularly worth highlighting to demonstrate how they are used in ActivityPub implementations. A link to the actor's "profile web page", if not equal to the value of id. The preferred "nickname" or "display name" of the actor. A quick summary or bio by the user about themselves. A link to an image or an Image object which represents the user's profile picture (this may be a thumbnail). Properties containing natural language values, such as name, preferredUsername, or summary, make use of natural language support defined in ActivityStreams. [ ActivityStreams ] defines the collection concept; ActivityPub defines several collections with special behavior. Note that ActivityPub makes use of ActivityStreams paging to traverse large sets of objects. Note that some of these collections are specified to be of type OrderedCollection specifically, while others are permitted to be either a Collection or an OrderedCollection. An OrderedCollection MUST be presented consistently in reverse chronological order. What property is used to determine the reverse chronological order is intentionally left as an implementation detail. For example, many SQL-style databases use an incrementing integer as an identifier, which can be reasonably used for handling insertion order in most cases. In other databases, an insertion time timestamp may be preferred. What is used isn't important, but the ordering of elements must remain intact, with newer items first. A property which changes regularly, such a "last updated" timestamp, should not be used. The outbox is discovered through the outbox property of an actor's profile. The outbox MUST be an OrderedCollection. The outbox stream contains activities the user has published, subject to the ability of the requestor to retrieve the activity (that is, the contents of the outbox are filtered by the permissions of the person reading it). If a user submits a request without Authorization the server should respond with all of the Public posts. This could potentially be all relevant objects published by the user, though the number of available items is left to the discretion of those implementing and deploying the server. The outbox accepts HTTP POST requests, with behaviour described in Client to Server Interactions. The inbox is discovered through the inbox property of an actor's profile. The inbox MUST be an OrderedCollection. The inbox stream contains all activities received by the actor. The server SHOULD filter content according to the requester's permission. In general, the owner of an inbox is likely to be able to access all of their inbox contents. Depending on access control, some other content may be public, whereas other content may require authentication for non-owner users, if they can access the inbox at all. The server MUST perform de-duplication of activities returned by the inbox. Duplication can occur if an activity is addressed both to an actor's followers, and a specific actor who also follows the recipient actor, and the server has failed to de-duplicate the recipients list. Such deduplication MUST be performed by comparing the id of the activities and dropping any activities already seen. The inboxes of actors on federated servers accepts HTTP POST requests, with behaviour described in Delivery. Non-federated servers SHOULD return a 405 Method Not Allowed upon receipt of a POST request. Every actor SHOULD have a followers collection. This is a list of everyone who has sent a Follow activity for the actor, added as a side effect. This is where one would find a list of all the actors that are following the actor. The followers collection MUST be either an OrderedCollection or a Collection and MAY be filtered on privileges of an authenticated user or as appropriate when no authentication is given. The follow activity generally is a request to see the objects an actor creates. This makes the Followers collection an appropriate default target for delivery of notifications. Every actor SHOULD have a following collection. This is a list of everybody that the actor has followed, added as a side effect. The following collection MUST be either an OrderedCollection or a Collection and MAY be filtered on privileges of an authenticated user or as appropriate when no authentication is given. Every actor MAY have a liked collection. This is a list of every object from all of the actor's Like activities, added as a side effect. The liked collection MUST be either an OrderedCollection or a Collection and MAY be filtered on privileges of an authenticated user or as appropriate when no authentication is given. Activities addressed to this special URI shall be accessible to all users, without authentication. Implementations MUST NOT deliver to the "public" special collection; it is not capable of receiving actual activities. However, actors MAY have a sharedInbox endpoint which is available for efficient shared delivery of public posts (as well as posts to followers-only); see 7.1.3 Shared Inbox Delivery. Compacting an ActivityStreams object using the ActivityStreams JSON-LD context might result in https://www.w3.org/ns/activitystreams#Public being represented as simply Public or as:Public which are valid representations of the Public collection. Implementations which treat ActivityStreams objects as simply JSON rather than converting an incoming activity over to a local context using JSON-LD tooling should be aware of this and should be prepared to accept all three representations. Every object MAY have a likes collection. This is a list of all Like activities with this object as the object property, added as a side effect. The likes collection MUST be either an OrderedCollection or a Collection and MAY be filtered on privileges of an authenticated user or as appropriate when no authentication is given. liked: Specifically a property of actors. This is a collection of Like activities performed by the actor, added to the collection as a side effect of delivery to the outbox. likes: May be a property of any object. This is a collection of Like activities referencing this object, added to the collection as a side effect of delivery to the inbox. Every object MAY have a shares collection. This is a list of all Announce activities with this object as the object property, added as a side effect. The shares collection MUST be either an OrderedCollection or a Collection and MAY be filtered on privileges of an authenticated user or as appropriate when no authentication is given. Activities as defined by [ ActivityStreams ] are the core mechanism for creating, modifying and sharing content within the social graph. Client to server interaction takes place through clients posting Activities to an actor's outbox. To do this, clients MUST discover the URL of the actor's outbox from their profile and then MUST make an HTTP POST request to this URL with the Content-Type of application/ld+json; profile="https://www.w3.org/ns/activitystreams". Servers MAY interpret a Content-Type or Accept header of application/activity+json as equivalent to application/ld+json; profile="https://www.w3.org/ns/activitystreams" for client-to-server interactions. The request MUST be authenticated with the credentials of the user to whom the outbox belongs. The body of the POST request MUST contain a single Activity (which MAY contain embedded objects), or a single non-Activity object which will be wrapped in a Create activity by the server. If an Activity is submitted with a value in the id property, servers MUST ignore this and generate a new id for the Activity. Servers MUST return a 201 Created HTTP code, and unless the activity is transient, MUST include the new id in the Location header. The server MUST remove the bto and/or bcc properties, if they exist, from the ActivityStreams object before delivery, but MUST utilize the addressing originally stored on the bto / bcc properties for determining recipients in delivery. The server MUST then add this new Activity to the outbox collection. Depending on the type of Activity, servers may then be required to carry out further side effects. (However, there is no guarantee that time the Activity may appear in the outbox. The Activity might appear after a delay or disappear at any period). These are described per individual Activity below. Attempts to submit objects to servers not implementing client to server support SHOULD result in a 405 Method Not Allowed response. HTTP caching mechanisms [ RFC7234 ] SHOULD be respected when appropriate, both in clients receiving responses from servers as well as servers sending responses to clients. Clients are responsible for addressing new Activities appropriately. To some extent, this is dependent upon the particular client implementation, but clients must be aware that the server will only forward new Activities to addressees in the to, bto, cc, bcc, and audience fields. The Followers Collection and/or the Public Collection are good choices for the default addressing of new Activities. Clients SHOULD look at any objects attached to the new Activity via the object, target, inReplyTo and/or tag fields, retrieve their actor or attributedTo properties, and MAY also retrieve their addressing properties, and add these to the to or cc fields of the new Activity being created. Clients MAY recurse through attached objects, but if doing so, SHOULD set a limit for this recursion. (Note that this does not suggest that the client should "unpack" collections of actors being addressed as individual recipients). Clients MAY give the user the chance to amend this addressing in the UI. The receiving outbox can then perform delivery to not only the followers of Chris (the liker), but also to Amy, and Amy's followers and Evan, both of whom received the original article. Clients submitting the following activities to an outbox MUST provide the object property in the activity: Create, Update, Delete, Follow, Add, Remove, Like, Block, Undo. Additionally, clients submitting the following activities to an outbox MUST also provide the target property: Add, Remove. The Create activity is used when posting a new object. This has the side effect that the object embedded within the Activity (in the object property) is created. When a Create activity is posted, the actor of the activity SHOULD be copied onto the object's attributedTo field. A mismatch between addressing of the Create activity and its object is likely to lead to confusion. As such, a server SHOULD copy any recipients of the Create activity to its object upon initial distribution, and likewise with copying recipients from the object to the wrapping Create activity. Note that it is acceptable for the object's addressing to be changed later without changing the Create's addressing (for example via an Update activity). For client to server posting, it is possible to submit an object for creation without a surrounding activity. The server MUST accept a valid [ ActivityStreams ] object that isn't a subtype of Activity in the POST request to the outbox. The server then MUST attach this object as the object of a Create Activity. For non-transient objects, the server MUST attach an id to both the wrapping Create and its wrapped Object. The Location value returned by the server should be the URL of the new Create activity (rather than the object). Any to, bto, cc, bcc, and audience properties specified on the object MUST be copied over to the new Create activity by the server. The Update activity is used when updating an already existing object. The side effect of this is that the object MUST be modified to reflect the new structure as defined in the update activity, assuming the actor has permission to update this object. For client to server interactions, updates are partial; rather than updating the document all at once, any key value pair supplied is used to replace the existing value with the new value. This only applies to the top-level fields of the updated object. A special exception is for when the value is the json null type; this means that this field should be removed from the server's representation of the object. Note that this behavior is for client to server interaction where the client is posting to the server only. Server to server interaction and updates from the server to the client should contain the entire new representation of the object, after the partial update application has been applied. See the description of the Update activity for server to server interactions for more details. The Delete activity is used to delete an already existing object. The side effect of this is that the server MAY replace the object with a Tombstone of the object that will be displayed in activities which reference the deleted object. If the deleted object is requested the server SHOULD respond with either the HTTP 410 Gone status code if a Tombstone object is presented as the response body, otherwise respond with a HTTP 404 Not Found. The Follow activity is used to subscribe to the activities of another actor. The side effect of receiving this in an outbox is that the server SHOULD add the object to the actor's following Collection when and only if an Accept activity is subsequently received with this Follow activity as its object. the target is not owned by the receiving server, and thus they are not authorized to update it. the object is not allowed to be added to the target collection for some other reason, at the receiving server's discretion. the object is not allowed to be removed from the target collection for some other reason, at the receiving server's discretion. The Like activity indicates the actor likes the object. The side effect of receiving this in an outbox is that the server SHOULD add the object to the actor's liked Collection. The Block activity is used to indicate that the posting actor does not want another actor (defined in the object property) to be able to interact with objects posted by the actor posting the Block activity. The server SHOULD prevent the blocked user from interacting with any object posted by the actor. Servers SHOULD NOT deliver Block Activities to their object. The Undo activity is used to undo a previous activity. See the Activity Vocabulary documentation on Inverse Activities and "Undo". For example, Undo may be used to undo a previous Like, Follow, or Block. The undo activity and the activity being undone MUST both have the same actor. Side effects should be undone, to the extent possible. For example, if undoing a Like, any counter that had been incremented previously should be decremented appropriately. There are some exceptions where there is an existing and explicit "inverse activity" which should be used instead. Create based activities should instead use Delete, and Add activities should use Remove. Federated servers MUST perform delivery on all Activities posted to the outbox according to outbox delivery. Servers MAY support uploading document types to be referenced in activites, such as images, video or other binary data, but the precise mechanism is out of scope for this version of ActivityPub. The Social Web Community Group is refining the protocol in the ActivityPub Media Upload report. Servers communicate with other servers and propagate information across the social graph by posting activities to actors' inbox endpoints. An Activity sent over the network SHOULD have an id, unless it is intended to be transient (in which case it MAY omit the id). POST requests (eg. to the inbox) MUST be made with a Content-Type of application/ld+json; profile="https://www.w3.org/ns/activitystreams" and GET requests (see also 3.2 Retrieving objects) with an Accept header of application/ld+json; profile="https://www.w3.org/ns/activitystreams". Servers SHOULD interpret a Content-Type or Accept header of application/activity+json as equivalent to application/ld+json; profile="https://www.w3.org/ns/activitystreams" for server-to-server interactions. deliver the Activity to recipients of the original object, to ensure updates are propagated to the whole social graph (see inbox delivery). an Activity being created in an actor's outbox with their Followers Collection as the recipient. an Activity being created in an actor's outbox with directly addressed recipients. an Activity being created in an actors's outbox with user-curated collections as recipients. an Activity being created in an actor's outbox or inbox which references another object. Servers performing delivery to the inbox or sharedInbox properties of actors on other servers MUST provide the object property in the activity: Create, Update, Delete, Follow, Add, Remove, Like, Block, Undo. Additionally, servers performing server to server delivery of the following activities MUST also provide the target property: Add, Remove. HTTP caching mechanisms [ RFC7234 ] SHOULD be respected when appropriate, both when receiving responses from other servers as well as sending responses to other servers. The following is required by federated servers communicating with other federated servers only. An activity is delivered to its targets (which are actors) by first looking up the targets' inboxes and then posting the activity to those inboxes. Targets for delivery are determined by checking the ActivityStreams audience targeting; namely, the to, bto, cc, bcc, and audience fields of the activity. The inbox is determined by first retrieving the target actor's JSON-LD representation and then looking up the inbox property. If a recipient is a Collection or OrderedCollection, then the server MUST dereference the collection (with the user's credentials) and discover inboxes for each item in the collection. Servers MUST limit the number of layers of indirections through collections which will be performed, which MAY be one. Servers MUST de-duplicate the final recipient list. Servers MUST also exclude actors from the list which are the same as the actor of the Activity being notified about. That is, actors shouldn't have their own activities delivered to themselves. What to do when there are no recipients specified is not defined, however it's recommended that if no recipients are specified the object remains completely private and access controls restrict the access to object. If the object is just sent to the "public" collection the object is not delivered to any actors but is publicly viewable in the actor's outbox. An HTTP POST request (with authorization of the submitting user) is then made to the inbox, with the Activity as the body of the request. This Activity is added by the receiver as an item in the inbox OrderedCollection. Attempts to deliver to an inbox on a non-federated server SHOULD result in a 405 Method Not Allowed response. For federated servers performing delivery to a third party server, delivery SHOULD be performed asynchronously, and SHOULD additionally retry delivery to recipients if it fails due to network error. Note: Activities being distributed between actors on the same origin may use any internal mechanism, and are not required to use HTTP. While it is not required reading to understand this specification, it is worth noting that ActivityPub's targeting and delivery mechanism overlaps with the Linked Data Notifications specification, and the two specifications may interoperably combined. In particular, the inbox property is the same between ActivityPub and Linked Data Notifications, and the targeting and delivery systems described in this document are supported by Linked Data Notifications. In addition to JSON-LD compacted ActivityStreams documents, Linked Data Notifications also supports a number of RDF serializations which are not required for ActivityPub implementations. However, ActivityPub implementations which wish to be more broadly compatible with Linked Data Notifications implementations may wish to support other RDF representations. The to, bto, cc, bcc or audience fields if their values are individuals or Collections owned by the actor. These fields will have been populated appropriately by the client which posted the Activity to the outbox. The following section is to mitigate the "ghost replies" problem which occasionally causes problems on federated networks. This problem is best demonstrated with an example. Alyssa makes a post about her having successfully presented a paper at a conference and sends it to her followers collection, which includes her friend Ben. Ben replies to Alyssa's message congratulating her and includes her followers collection on the recipients. However, Ben has no access to see the members of Alyssa's followers collection, so his server does not forward his messages to their inbox. Without the following mechanism, if Alyssa were then to reply to Ben, her followers would see Alyssa replying to Ben without having ever seen Ben interacting. This would be very confusing! This is the first time the server has seen this Activity. The values of to, cc, and/or audience contain a Collection owned by the server. The values of inReplyTo, object, target and/or tag are objects owned by the server. The server SHOULD recurse through these values to look for linked objects owned by the server, and SHOULD set a maximum limit for recursion (ie. the point at which the thread is so deep the recipients followers may not mind if they are no longer getting updates that don't directly involve the recipient). The server MUST only target the values of to, cc, and/or audience on the original object being forwarded, and not pick up any new addressees whilst recursing through the linked objects (in case these addressees were purposefully amended by or via the client). The server MAY filter its delivery targets according to implementation-specific rules (for example, spam filtering). For servers hosting many actors, delivery to all followers can result in an overwhelming number of messages sent. Some servers would also like to display a list of all messages posted publicly to the "known network". Thus ActivityPub provides an optional mechanism for serving these two use cases. When an object is being delivered to the originating actor's followers, a server MAY reduce the number of receiving actors delivered to by identifying all followers which share the same sharedInbox who would otherwise be individual recipients and instead deliver objects to said sharedInbox. Thus in this scenario, the remote/receiving server participates in determining targeting and performing delivery to specific inboxes. Additionally, if an object is addressed to the Public special collection, a server MAY deliver that object to all known sharedInbox endpoints on the network. Origin servers sending publicly addressed activities to sharedInbox endpoints MUST still deliver to actors and collections otherwise addressed (through to, bto, cc, bcc, and audience) which do not have a sharedInbox and would not otherwise receive the activity through the sharedInbox mechanism. Receiving a Create activity in an inbox has surprisingly few side effects; the activity should appear in the actor's inbox and it is likely that the server will want to locally store a representation of this activity and its accompanying object. However, this mostly happens in general with processing activities delivered to an inbox anyway. For server to server interactions, an Update activity means that the receiving server SHOULD update its copy of the object of the same id to the copy supplied in the Update activity. Unlike the client to server handling of the Update activity, this is not a partial update but a complete replacement of the object. The receiving server MUST take care to be sure that the Update is authorized to modify its object. At minimum, this may be done by ensuring that the Update and its object are of same origin. The side effect of receiving this is that (assuming the object is owned by the sending actor / server) the server receiving the delete activity SHOULD remove its representation of the object with the same id, and MAY replace that representation with a Tombstone object. (Note that after an activity has been transmitted from an origin server to a remote server, there is nothing in the ActivityPub protocol that can enforce remote deletion of an object's representation). The side effect of receiving this in an inbox is that the server SHOULD generate either an Accept or Reject activity with the Follow as the object and deliver it to the actor of the Follow. The Accept or Reject MAY be generated automatically, or MAY be the result of user input (possibly after some delay in which the user reviews). Servers MAY choose to not explicitly send a Reject in response to a Follow, though implementors ought to be aware that the server sending the request could be left in an intermediate state. For example, a server might not send a Reject to protect a user's privacy. In the case of receiving an Accept referencing this Follow as the object, the server SHOULD add the actor to the object actor's Followers Collection. In the case of a Reject, the server MUST NOT add the actor to the object actor's Followers Collection. Sometimes a successful Follow subscription may occur but at some future point delivery to the follower fails for an extended period of time. Implementations should be aware that there is no guarantee that actors on the network will remain reachable and should implement accordingly. For instance, if attempting to deliver to an actor for perhaps six months while the follower remains unreachable, it is reasonable that the delivering server remove the subscriber from the followers list. Timeframes and behavior for dealing with unreachable actors are left to the discretion of the delivering server. The side effect of receiving this in an inbox is determined by the type of the object received, and it is possible to accept types not described in this document (for example, an Offer). If the object of an Accept received to an inbox is a Follow activity previously sent by the receiver, the server SHOULD add the actor to the receiver's Following Collection. The side effect of receiving this in an inbox is determined by the type of the object received, and it is possible to reject types not described in this document (for example, an Offer). 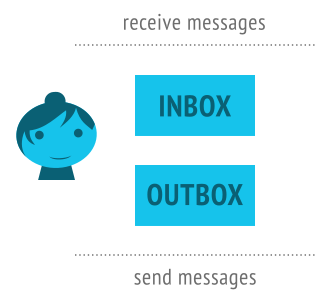 If the object of a Reject received to an inbox is a Follow activity previously sent by the receiver, this means the recipient did not approve the Follow request. The server MUST NOT add the actor to the receiver's Following Collection. the target is not owned by the receiving server, and thus they can't update it. the object is not allowed to be added to the target collection for some other reason, at the receiver's discretion. the object is not allowed to be removed to the target collection for some other reason, at the receiver's discretion. The side effect of receiving this in an inbox is that the server SHOULD increment the object's count of likes by adding the received activity to the likes collection if this collection is present. Upon receipt of an Announce activity in an inbox, a server SHOULD increment the object's count of shares by adding the received activity to the shares collection if this collection is present. The Announce activity is effectively what is known as "sharing", "reposting", or "boosting" in other social networks. The Undo activity is used to undo the side effects of previous activities. See the ActivityStreams documentation on Inverse Activities and "Undo". The scope and restrictions of the Undo activity are the same as for the Undo activity in the context of client to server interactions, but applied to a federated context. Building an international base of users is important in a federated network. ActivityStreams provides tooling for internationalization of content, which should be used whenever possible. However, it can be difficult for implementations to determine which @language property to provide for user-submitted content. The W3C Internationalization group provides some guidance on language detection. ActivityPub uses authentication for two purposes; first, to authenticate clients to servers, and secondly in federated implementations to authenticate servers to each other. Unfortunately at the time of standardization, there are no strongly agreed upon mechanisms for authentication. Some possible directions for authentication are laid out in the Social Web Community Group Authentication and Authorization best practices report. Servers should not trust client submitted content, and federated servers also should not trust content received from a server other than the content's origin without some form of verification. Servers should be careful to verify that new content is really posted by the actor that claims to be posting it, and that the actor has permission to update the resources it claims to. See also 3. Objects and B.1 Authentication and Authorization. It is often convenient while developing to test against a process running on localhost. However, permitting requests to localhost in a production client or server instance can be dangerous. Making requests to URIs on localhost which do not require authorization may unintentionally access or modify resources assumed to be protected to be usable by localhost-only. If your ActivityPub server or client does permit making requests to localhost URIs for development purposes, consider making it a configuration option which defaults to off. There are many types of URIs aside from just http and https. Some libraries which handle fetching requests at various URI schemes may try to be smart and reference schemes which may be undesirable, such as file. Client and server authors should carefully check how their libraries handle requests, and potentially whitelist only certain safe URI types, such as http and https. Servers should set a limit on how deep to recurse while resolving objects, or otherwise specially handle ActivityStreams objects with recursive references. Failure to properly do so may result in denial-of-service security vulnerabilities. Spam is a problem in any network, perhaps especially so in federated networks. While no specific mechanism for combating spam is provided in ActivityPub, it is recommended that servers filter incoming content both by local untrusted users and any remote users through some sort of spam filter. Servers should implement protections against denial-of-service attacks from other, federated servers. This can be done using, for example, some kind of ratelimiting mechanism. Servers should be especially careful to implement this protection around activities that involve side effects. Servers SHOULD also take care not to overload servers with submissions, for example by using an exponential backoff strategy. It prevents malicious clients from conducting denial-of-service attacks on the server. It ensures that the server will not distribute so many activities that it triggers another server's denial-of-service protections. In order to prevent a client from being overloaded by oversized Collections, servers should take care to limit the size of Collection pages they return to clients. Clients should still be prepared to limit the size of responses they are willing to handle in case they connect to malicious or compromised servers, for example by timing out and generating an error. Any activity field being rendered for browsers (or other rich text enabled applications) should take care to sanitize fields containing markup to prevent cross site scripting attacks. bto and bcc already must be removed for delivery, but servers are free to decide how to represent the object in their own storage systems. However, since bto and bcc are only intended to be known/seen by the original author of the object/activity, servers should omit these properties during display as well. This specification comes from years of hard work and experience by a number of communities exploring the space of federation on the web. In particular, much of this specification is informed by OStatus and the Pump API, as pioneered by StatusNet (now GNU Social) and Pump.io. Both of those initiatives were the product of many developers' hard work, but more than anyone, Evan Prodromou has been a constant leader in this space, and it is unlikely that ActivityPub would exist in something resembling its current state without his hard work. Erin Shepherd built the initial version of this specification, borrowed from the ideas in the Pump API document, mostly as a complete rewrite of text, but sharing most of the primary ideas while switching from ActivityStreams 1 to ActivityStreams 2. Jessica Tallon and Christopher Lemmer Webber took over as editors when the standard moved to the W3C Social Working Group and did the majority of transition from Erin Shepherd's document to its current state as ActivityPub. Much of the document was rewritten and reorganized under the long feedback process of the Social Working Group. ActivityPub has been shaped by the careful input of many members in the W3C Social Working Group. ActivityPub especially owes a great debt to Amy Guy, who has done more than anyone to map the ideas across the different Social Working Group documents through her work on [ Social-Web-Protocols ]. Amy also laid out the foundations for a significant refactoring of the ActivityPub spec while sprinting for four days with Christopher Allan Webber. These revisions lead to cleaner separation between the client to server and server components, along with clarity about ActivityPub's relationship to [ LDN ], among many other improvements. Special thanks also goes to Benjamin Goering for putting together the implementation report template. We also thank mray for producing the spectacular tutorial illustrations (which are licensed under the same license as the rest of this document). Many people also helped ActivityPub along through careful review. In particular, thanks to: Aaron Parecki, AJ Jordan, Benjamin Goering, Caleb Langeslag, Elsa Balderrama, elf Pavlik, Eugen Rochko, Erik Wilde, Jason Robinson, Manu Sporny, Michael Vogel, Mike Macgirvin, nightpool, Puck Meerburg, Sandro Hawke, Sarven Capadisli, Tantek Çelik, and Yuri Volkov. This document is dedicated to all citizens of planet Earth. You deserve freedom of communication; we hope we have contributed in some part, however small, towards that goal and right. These questions provide an overview of security and privacy considerations for this specification as guided by [ security-privacy-questionnaire ]. Does this specification deal with personally-identifiable information? ActivityPub's actors may contain information about the associated user. At minimum, the actor profile contains an identifier which also provides a mechanism for contacting the user, through the exposed actor's inbox. Aside from this, ActivityPub does not mandate any personally identifiable information to operate, though depending on the implementation, any number of details may be exposed on the actor's profile, particularly user names and real names. Additionally, a notification payload could include personally identifiable information, depending on the implementation and use, but it is again not required for the core functionality to operate. Does this specification deal with high-value data? Same implications as personally-identifiable information in notification payload (as mentioned above). The application supplies no normative mechanism for authentication from clients to servers, but depending on what mechanism is used, OAuth tokens may be exposed, particularly if HTTP is used without TLS/SSL support. Similarly, no normative mechanism for authentication between servers is exposed, though without TLS/SSL support, OAuth tokens could be exposed here as well. Does this specification introduce new state for an origin that persists across browsing sessions? No. Clients may choose to cache server state information supplied through the application, though this is not mandated or specified. Does this specification expose persistent, cross-origin state to the web? Yes. Clients, if appropriately authorized, may read some inbox / outbox information from other actors on the web. Additionally, servers both read and submit activities to other servers on the network. Does this specification expose any other data to an origin that it doesn’t currently have access to? No. (Or at least, not as far as the person filling out this section can tell). Does this specification enable new script execution/loading mechanisms? Does this specification allow an origin access to a user’s location? Does this specification allow an origin access to sensors on a user’s device? Does this specification allow an origin access to aspects of a user’s local computing environment? Does this specification allow an origin access to other devices? Does this specification allow an origin some measure of control over a user agent’s native UI? Does this specification expose temporary identifiers to the web? Not directly. However, mechanisms to authenticate an actor or authorize behavior might. Does this specification distinguish between behavior in first-party and third-party contexts? How should this specification work in the context of a user agent’s "incognito" mode? Being in "incognito" mode means that authentication information a browser or agent might keep between sessions would not be preserved, thus limiting access to any content requiring explicit authorization. Does this specification persist data to a user’s local device? This depends on implementation. Clients might choose to cache activities they have previously seen, but this is not a normative requirement. Depending on the authentication method used, authentication tokens or keys may be persisted. Does this specification have a "Security Considerations" and "Privacy Considerations" section? Does this specification allow downgrading default security characteristics? Removed at-risk note for media upload, since that was removed in the last iteration. Updates to the tutorial and a few other non-normative sections clarifying relationships between users, actors, and accounts. liked property was previously a SHOULD in one section and a MAY in another; changed both to MAY. Clarified that the outbox delivery section is for the union of client-to-server and server-to-server implementations. Added a note explaining what the forwarding mechanism is for. Add a MAY for servers accepting application/activity+json to outbox. Don't require forwarding to bto/bcc properties that will never be seen. Note that bto/bcc should be removed for display, but don't dictate for store. The new display bit was noted in the security considerations section. Replace "objects" word with "activities" in inbox/outbox stream sections, which is a more accurate explanation. Restructure author section, adding Amy Guy and Evan Prodromou. Move the bulk of the (informative) Authentication and Authorization section to the CG wiki, and add a link. Updates to Security Considerations about client denial-of-service attacks and server exponential backoff, and Auth stub. Clarify content-type for server-to-server requests. Remove Media Upload protocol and endpoint (it was at risk). Note about JSON-LD compaction of Public collection URI. Elevate Client Addressing to its own section (no new prose). Edits to text about "actors" and "users" to clarify that AP doesn't impose or expect person-to-account ratio constraints. Fix inReplyTo being on Create instead of Note. Give the LDN relationship note a decent URL hash. Note recursive objects in Security Considerations and give suggestion on how to handle. Fix broken OAuth Discovery link. Fixed some examples (rename likes to liked in actors example, change object property to type). Fix various examples of "author" mistakenly used where "actor" should be. Add section on federation denial-of-service. [Normative] Make adding to outbox collection on client to server section a MUST. Various typo / grammar fixes. Call attention to the Public Inbox Delivery section in Public Addressing. "Spoofing prevention" used author attribute instead of attributedTo, fixed. Clarify wording around adding id in client to server communication. When listing inbox and outbox properties, explicitly call them OrderedCollections (as they are represented later). Use "summary" on Liking the minimal update client example instead of "name". Add another example of delivery for user-curated collections. Clarify behavior of delivery to the same origin. [Normative] Specify delivery behavior on non-federated servers. [Possibly normative] Add notes about HTTP caching. Refer to actors as "actors" instead of as "agents" in Server to Server Interactions section. Fix Activity Vocabulary not being in References. [Normative] Include the option for actors to be a Profile object and Clarify language surrounding what can be an actor. [Normative] Remove reference to Actors being subclass of the Actor type. Add note about flow for acquiring bearer tokens and client IDs. Rename OAuth endpoints to match RFC6749. [Normative] Rename present "likes" collection for actors to "liked". Reordered collections section, putting outbox and inbox collections first. [Normative] Add "likes" section and reference it in Like inbox side effects section. [Normative] Add the shares property and Announce activity and describe federated behavior. [Normative] Client to server no longer required for server to server in conformance classes. Reorder outbox submission bit in C2S Interactions. Replace present "Overview" with a tutorial. [Possibly normative, but probably not] Clarify that clients traversing build-up of addressing doesn't mean unpack collections. [Normative] Mention returning 405 Method Not Allowed when submitting objects to non-c2s outboxes. Move Uploading Media section directly into the Client to Server section. Clarify submitting to uploadMedia endpoint does not involve outbox submission. Various wording clarifications and grammatical fixes. Update security and privacy questionnaire answers for incognito mode and "local device" to be closer to implementation. Correct typo in Content-Type for posting to outbox. Move duplicate ActivityStreams properties from main Actors section into subsection that's marked clearly as non-normative. Added @language to many examples. Linked to the i18n LanguageDetection wiki page. Switched to using a Japanese example for Person example. Note that ActivityPub shares the same URI / IRI conventions as in ActivityStreams. Added notes about text direction for natural language values. More clearly reference ActivityStreams targeting in the overview. Clarify that followers/following are links/uris, not embedded. Clarify that likes/following/followers collections MAY be filtered. Switch over to activitystreams namespace. Update the special Public collection to point to use a fragment identifier. Switch federation like side effect from MAY->SHOULD and widen effect possibilities. Make ActivityPub document readable without LDN, but clearly describe overlap. Beter text around displaying 404 or 403 if an object is private. Add Undo activity for federated contexts. Add public content delivery section, marked at risk. Add non-normative recommendation that implementations seeking to gain broader interop with LDN might want to support other RDF types. "Object without Create" section marked at-risk. Renamed "Binary Data" to "Uploading Media". Significant refactoring to media endpoint's mechanism. Now works on a single request. Add text about adding an id to both an object and its wrapping Create. Add Public special collection to some more examples. Note that implementations MUST NOT deliver to the Public special collection. Merged targeting and delivery; remove outdated "notification targeting". Note that bcc/bto must be stripped from the delivered ActivityStreams object. Add SHOULD on not overloading servers with submissions; recommend exponential backoff. Move "Partial Updates" to own section; mark at risk. Explicitly name addressing properties to copy for object creation w/o Create. Add bto and audience to everything that isn't referencing it currently and Reference the ActivityStreams audience targeting directly. Fixed non-normative citation of Micropub and Social Web Protocols. Went over all MAY / SHOULD / MUST and made sure correct everywhere. Note where object and target are required. Clarify transient messages: allowed, and happen by omitting id (not via fragment id). Clarify that the proxyUrl uses a form-urlencoded id parameter. Point to the AS2 docs on Undo. Added Create and Delete activities to the server to server side effects section and put all listed activities in the same order as in client to server. Updated @context on one example where @language moving around was reported to be confusing/distracting. Added security / privacy review section. Note that using "https" as a default scheme is ok in clients, if a user neglected to provide one. Adjusted text around what verification methods are possible. Added @language to first example. Explain what we mean by "presented consistently in reverse chronological order" with regard to OrderedCollection. Clarify both transient identifiers and the requirements for "id"
Reference the Social Working Group, Social Web protocols, and Micropub. Clarify that upon initial Create, both Create and object should share addressing. Clarify that what was previously called "streams" use OrderedCollections; remove "streams" as an independent term. Add "endpoints" property to actor, move mediaEndpoint here and rename to "uploadMedia". Add "oauthClientAuthorize", "provideClientKey", and "signClientKey" endpoints. More clear specification of content negotiation on retrieving AS2 objects; make application/ld+json; profile="https://www.w3.org/ns/activitystreams" the default media type. Servers MAY do content negotiation but MUST respond with AS2 to the right content type. "Update" when used for client to server interactions may provide partial updates, but the complete activity is still sent from server to server and server to client. Support for Linked Data Signatures added as an auth mechanism. Add ActivityPub context to all examples. Explain what the ActivityPub context is and how it should be used. Clarification on file endpoint / binary uploads. Removed reference to HTTP PUT and DELETE verbs. Copy an activity's "actor" field to the "attributedTo" field. Restructuring and clarification around notification and delivery. Added Evan Prodromou and Erin Shepherd as authors to spec. New, clearly delineated "Client to Server Interactions" and "Server to Server Interactions" sections. Server to server functionality now utilizes Linked Data Notifications. Moved activities section into the client to server / server to server sections, described as side effects. Collections moved earlier in document. Binary data section moved to after Collections. Notifications folded into targeting/delivery sections. Removed duplicated content (endpoint discovery, inbox and outbox sections). When creating an object, return 201 created with Location header pointing to the Create activity. Moved some links from http to https. Clarify that objects may be submitted without a wrapping activity, and will be wrapped by Create on server. Clarification around removing content, Tombstones, expected http status on fetching removed objects. Describe delivery to collections not owned by replying user, forwarded by original poster. Moved following, followers, url to "SHOULD" properties. Removed objectTypes text and simplified "streams" definition. Removed vague term "share activity". Changed MAY to MUST for inbox reading. Replaced all "@type" and "@id" with "type" and "id". Clarified and fixed up followers section. Added "Note" type to receiving activity example. Dropped implied "@context" from an example. Added audience targeting to examples. New text allowing silent and private activities. Removed reference to access control in Delivery section. Added section clarifying the ACL. Added an optional "streams" property example. Moved preferredUsername, summary, icon to "MAY" provideable actor properties. Clarified dereferencing collection to deliver to contained users. Require validating objects posted to inbox. Incoming activities MUST have a valid URI as id. Clarify when identifiers are required. Permit submitting objects without activities for client to server object creation.